The Norwegian artist Aurora says you can make fun of everything, except moths. – Never screw with a moth, is her message! 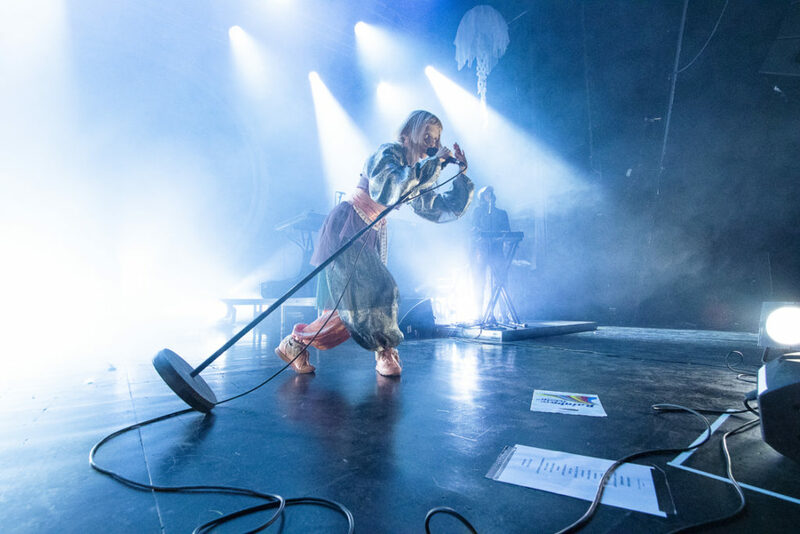 Read my review of her amazing gig in Oslo last night. It was when vocalist Jon Anderson gave his all at the beginning of the last section of “Heart of the Sunrise” that the hairs on the back of my neck were higher up than a Republican’s hackles if you mention Hillary Clinton. But which Yes was on stage this evening? Don’t worry. If you are uninitiated, I’m not even going to attempt to explain the complicated story of exactly who is or isn’t a member of Yes at any given moment. Let’s just say that it’s complicated. I mean, really complicated. Just take my word for it, ok? It’s so complicated that these days there are two versions of Yes currently on their 50th anniversary tours. 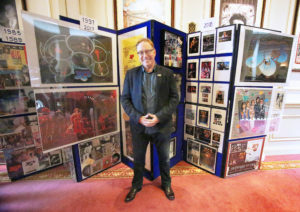 I saw the other Yes this Easter during the 50th anniversary celebrations at the London Palladium. Said band has no original members left after bassist Chris Squire died. Still, they are the ones named just Yes, and they also are in possession of the rights to the famous Yes logo. Third man out is keyboardist Rick Wakeman, who’s been in and out of Yes so many times that I ran out of fingers trying to count them. However, say “Yes” and “keyboardist” in the same sentence, and most people will say “Rick Wakeman.” He’s also had a solo career that resulted him selling more records than Yes ever did. 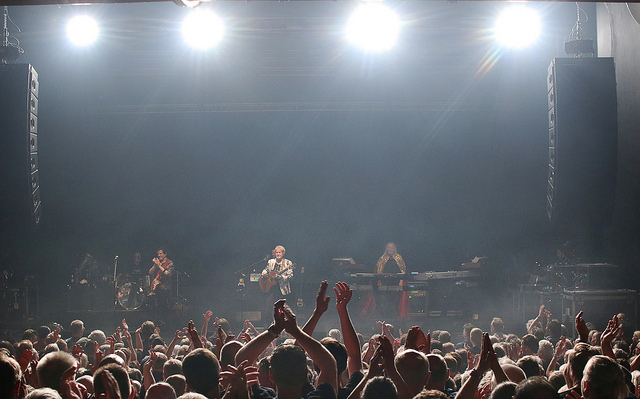 The last time I saw Yes on Norwegian ground it was the other Yes, with Benoit David on vocals. That was an unmitigated disaster of the biggest proportions. David sang so out of tune that a dead hamster buried in the basement of a 30 storey house under a ton of bricks would have tried to get away. 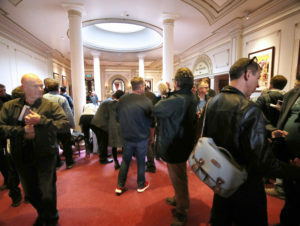 And people left the concert in droves. However, with Wakeman and Anderson on the bill, it seemed that Norwegian Yes fans were willing to give this version of Yes a chance. 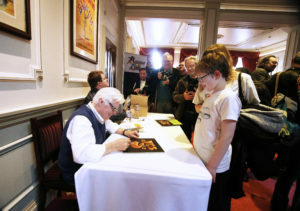 I was also pleased to see so many young faces there, even if I was below the medium age in the room. But it didn’t really matter, because the band was welcomed with arms that were more open than a Scotsman being told he will be paid in cash. And it’s been a long time since I saw that many people at this particular venue. 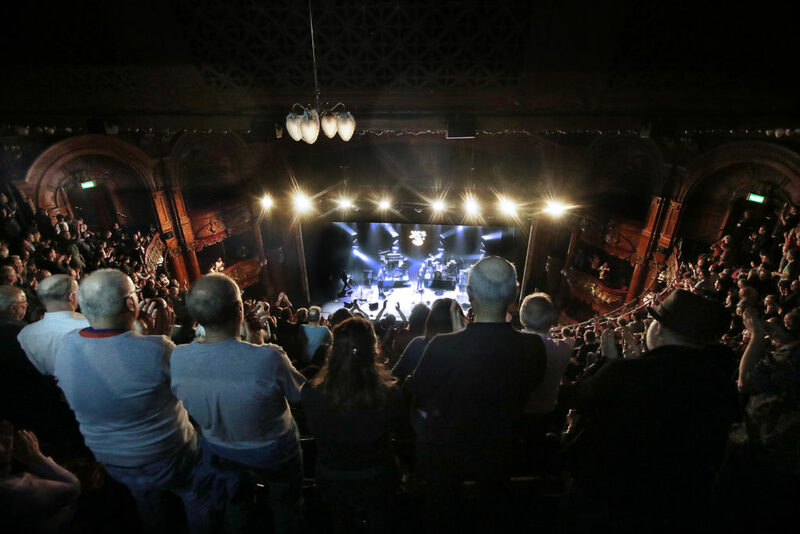 The concert started with the instrumental “Cinema” from the album “90125,” before we jumped into “Hold On” from the same album. Then it was straight back to the 70s to perform “South Side of the Sky,” a song Yes almost never played in their 70s heyday. We stayed in that decade to be served one of Yes’ most famous songs, “I’ve Seen All Good People” (- For all the good people of Oslo, as Anderson said). 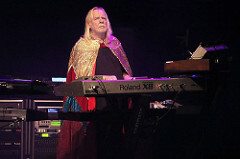 Wakeman was in character in a long glittering cape going all the way from his shoulders to the floor (you get away with that sort of thing if your name is Rick Wakeman). His fingers were dancing over the keys like they were made of air. All the soup diets he’s constantly tweeting about didn’t seem to have had much effect, but my oh my how he played. It wasn’t quite up there where it used to be, but my music teacher in middle school would have given him a A-. At least! Rabin is a few years younger than Wakeman and Anderson, but he is the one who has been seeing a plastic surgeon on a regular basis, as well as getting lots of hair transplants. He looked like a cross between Ray Monroe in Twin Peaks, Michael Jackson and Little Richard. 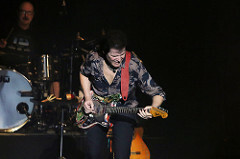 Still, he’s a great guitarist and I didn’t mind the rearrangements he did of some of the 70s material. Drummer Lou Molino III played the drums and percussion just brilliantly, and bassist Lee Pomeroy got to play around with “Heart of the Sunrise,” where the entire opening riff is carried by the bass. 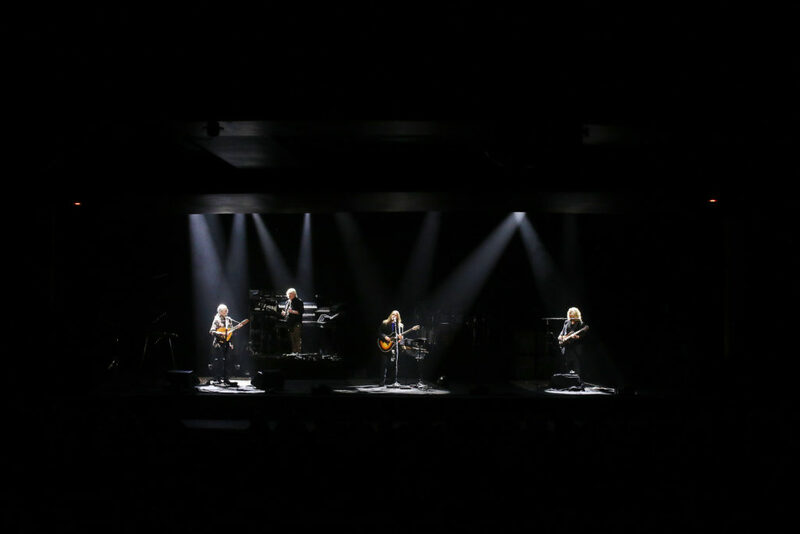 However, for a band that was started by one of the most brilliant, and original, bass players of all time, Chris Squire, it’s just plain wrong to hide the bass in the mix the way they are doing on this tour. Stop it! The concert also lasted for just over two hours, way too short for a Yes concert! But that is just nitpicking when you think back on such magic moments like “Awaken,” where harp, church organ and Jon’s cosmic lyrics made you fly so high that you wondered if you had consumed other remedies than just beer that night. The version they did of “Owner of a Lonely Heart” was also fantastic. Especially the incredible jam session they did towards the end, including a keytar solo. Please come back soon, Yes featuring ARW. I am waiting! I am ready! This is an English translation of a big interview I did for one of Norway’s largest newspapers, Dagbladet. In addition to translating the interview, I’ve also included all the content I had to cut out of the Norwegian version for space reasons. I’ve also included more photos, which you can click on to see in high res versions. Enjoy, and please, let me know what you think. – You were from Norway, right? – Yes, I’m the guy who always say hello to you from Röyksopp, and then you tell me to say hello back, because I meet you guys every other time. – That’s right! Please, say hi back. I love them, I’m very sorry that we didn’t have time to cooperate on my Electronica project. Anyway, what I was going to say was that Norwegians are very sophisticated and talk bluntly. I think one of the reasons for this is that you are rich and a bit spoiled. I mean this in the best way possible. You demand something from an artist and you are not easily fooled. And because of this, when you like something the reception becomes much more honest and sincere. The words are from the French master of synths, Jean-Michel Jarre. This Friday he will release his third album in what has become the Oxygene trilogy. 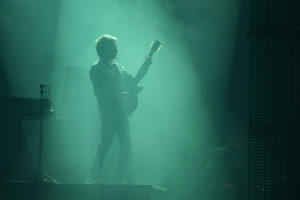 In the past two months he’s played 40 cities in Europe, he visited Oslo Spektrum in October. 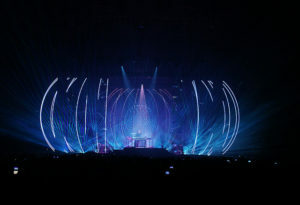 On this tour, he has played music from Electronica 1 and 2 which were released last autumn and this spring. THE FRENCHMAN looks annoyingly young considering that he is 68 years old. We caught up with him backstage during the tour before his concert in Brussels. One would think that after selling 80 million records in a career that spans 40 years and putting up multimedia shows that attracts audiences of millions in Houston, London, Paris, Moscow and other cities, you will become jaded. Not so with Jarre. Instead he comes across as a young boy on Red Bull. 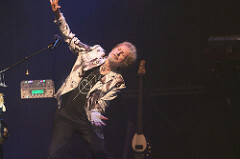 He got his international breakthrough with his third album, Oxygene, in 1976. In 1997 he released a sequel called Oxygene 7-13 and on the exact day of the 40th anniversary of the first one, he will be releasing Oxygene 3. – You’ve released three albums in the span of just 15 months, with almost five hours of music. That’s a pretty hectic release schedule? 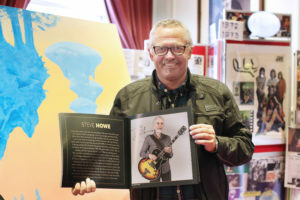 – It wasn’t planned that way, but my record company wanted to celebrate the 40th anniversary of the first one and asked me if I had any ideas. I don’t celebrate anniversaries. I take that after my mother. She never even called me on my birthday. When I asked her why, she said “I gave you birth, you should call me!” But while working on Electronica I composed a piece of music that I felt didn’t suit that particular project, so I put it aside. I actually felt like I did during the creation of the first Oxygene when I did that track, so when the request from the record company came, I remembered it. I then decided to do the entire album like that. Playing with frequencies, sounds and sections, and do it alone, in my home studio, in just six weeks, like I did back in 1976. I started in July and was finished in September. I only had a small break in August where I was stuck and decided to stop being a musician and become a painter instead. By the way, did you get the chance to listen to the album? – Yes, they gave me a digital preview copy which I listened to in the hotel room last night. – You know, I just handed in the master tapes and then I went straight on tour. Not even my family has listened to it yet, so you are the first one I’ll get any feedback from. What did you think? – I had a huge grin on my face while listening to it. I really liked it. Especially Part 19, which sounded like a rave party with a melody line and sounds from your Deserted Palace thrown on top. – I’m so happy to hear you say that, because that’s the track I just told you about, the very first one I did for this project! Jarre insists that he didn’t listen to the two previous albums while composing the third one. – No, the thought was just to work after the same principles. Sculpting sounds and melodies out of frequencies and playfulness. AFTER OXYGENE Jarre released a string of electronic albums that sold millions and created a template that has been used by a whole generation of electronica bands and projects like Röyksopp, M83 and scores of trance-, techno- and dance artists in the 90s and 2000s. His huge outdoor concerts, using entire cityscapes as his canvas became a proto type for rave parties. Despite his vast influence, critics have never been on his side. Until now. 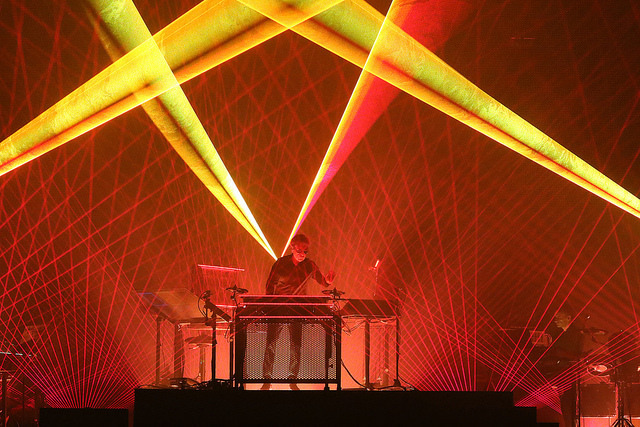 – In the last few years you’ve started getting good reviews, not least for this tour and the Electronica albums. Do you think there is a new generation of music journalists taking over after the old school writers? Jarre nods. – You’ve got to remember that I’m a French child of the 60s revolutions. We were in opposition to the establishment, including rock’n’roll. When we started using electronic instruments instead of traditional tools to create music, we weren’t seen as real composers or musicians. 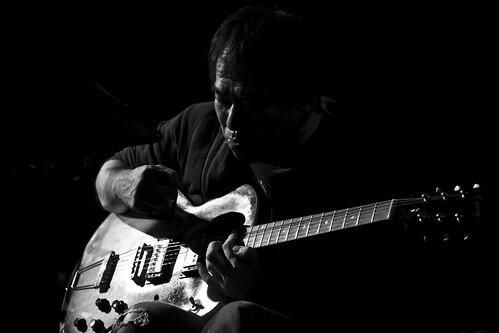 Electronic music was looked down upon by rock musicians. Just like jazz musicians looked down upon rock musicians and classical musicians looked down on jazz. Today everything is a wonderful mix of all genres. Even jazz musicians are fiddling with electronic devices these days. I feel more in sync with today’s music scene than I ever did in the past. ANOTHER THING that is more common these days than in the past Is something that Jarre and Pink Floyd almost used to have a monopoly on: Multimedia concerts with gigantic projections, lasers and lights For both artists, they became as important as the music. But Jarre says he’s never set out to top himself. – I wanted to do something I hadn’t done before. He stops and laughs at himself. – That’s something all artists say. It’s almost impossible to do something that hasn’t been done before. But even if we all have big expensive digital cameras today, there’s only one Quentin Tarantino. It’s who you are and what you want to convey that is important. – But people writing about your concerts are saying that are doing something very unique. 3D without the need for 3D glasses. Jarre goes straigt back in to his young boy modus again. – Yes, and that’s a feedback I really like. I’ve always included visual elements in my concerts, but this time the challenge was to do 3D without those pesky 3D glasses. I hate them and I gladly pay extra to see films in 2D instead. So my idea was to use LED screens which can create that effect, without the need for those damn glasses. And we’ve succeeded, even for the people sitting in the side aisles. He then tells the story of the three arrogant British technicians who came to assist on certain aspects of the show. Their sniffy attitude was quickly erased when they got a demonstration on what Jarre and his team had achieved. – Fiona (Jarre’s manager) overheard them talking, and they said that “that was really something.” And that was a fantastic feedback to. When people in the business like it, you know that It’s going to be copied. And that’s the sincerest form of flattery. AFTER EIGHT YEARS of silence on the recording front, Jarre released two volumes of his Elecronica project in six months. The first one in November 2015 and the second one in May this year. He spent four years travelling around in Europe and the US to create songs with Pet Shop Boys, Moby, Vince Clarke (Depeche Mode and Erasure), Massive Attack, Pete Townshend (The Who), Laurie Anderson, M83, Yello, the movie director and composer John Carpenter and a whole lot of other artist within the electronica field. Most of the concerts on the tour consist of songs from these two albums. One of the more original guests on Electronica 2 is Edward Snowden. With the assistance of journalists from The Guardian, Jarre visited him in Moscow and recorded a speech by Snowden. 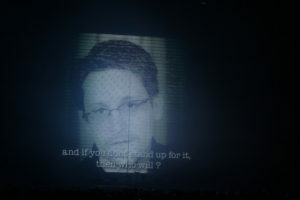 In the speech Snowden says that if you are not willing to stand up for your rights for privacy, then who will? – It’s unusual for you to be so political? Jarre takes his Espresso and leans back on the couch and looks a little bit skeptical at me. – Are you so sure that I am political? I don’t think I am. Remember that music can have two facets. You music that is simply to have fun with and dance and party to. And then you have the kind of music that want to say something about the times we are living in, music that wants to convey a message. This is something Bob Dylan, who just won the Nobel Prize for literature, is a perfect example of. But I don’t like artists who use the stage as a political platform. HE STRAIGHTENS UP in the sofa and starts a long speech about Snowden, Wikileaks, the Big Brother surveillance society, disillusioned kids and the challenges we, as a society, are facing. – Snowden did what he did out of love for his country. Remember, he was the third generation in a family of soldiers. And he’s still a soldier. He risked his life for this. I think Norway has always been at the forefront for personal freedom and individual rights. I think Snowden could have moved to Norway. When I tell Jarre that Snowden couldn’t even come to my hometown, Molde, to receive the Bjørnson award because the Norwegian authorities couldn’t guarantee that they wouldn’t hand him over to the US authorities, he looks truly saddened. – That surprises me, he says. He goes on: – Remember that most progress in the world comes out of disobedience. Even the US was founded on an act of treason. And the values the founding fathers fought for, that’s the values Snowden fights for. I think the EU has been cowards when it comes to the stuff Snowden and Wikileaks have revealed. Especially France. No wonder the kids in France are rebelling. AS THE PRESIDENT OF CISAC, the international organization for artists rights, the challenges in a digital society is something he is very aware of. – The entertainment industry has never generated more money than it is doing these days. But the people making the art which is creating this revenue is paid nothing. Where is the money going? This is a huge challenge that we have to deal with if we want to have artists or musicians in the future. Intellectual rights are also huan rights. I’ve done pretty well for myself, but I’m thinking of the next generation. 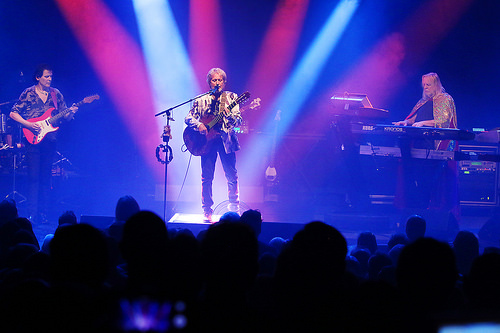 WITH OXYGENE 3, and the two Electronic albums, Jarre feels he has gone back to his roots. –I’ve gone back to the way I used to work. Mixing ingredients like a cook, only I’m mixing frequencies, sounds and sonic textures. Sequels are very common with games and movies, but they are much rarer when it comes to music. The only one I can think of, besides me, is Mike Oldfield. But I still hope I’m doing something that sounds fresh in a world where people zap on after just five seconds. And when I then add my old classics in the set list of the tour, albeit in a rearranged form, it all hopefully becomes fresh and exciting. I want to surprise myself, as well as the audience. 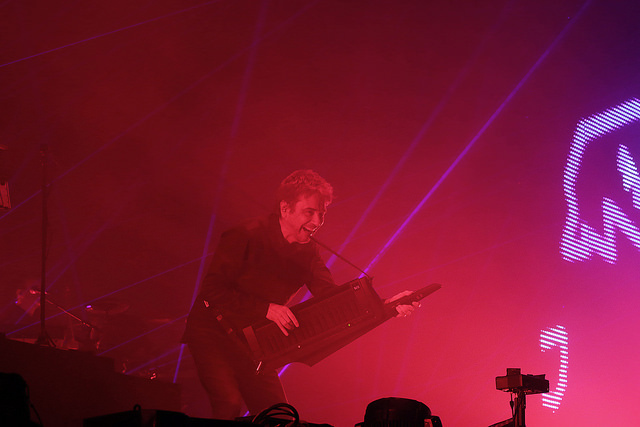 Keytar Hero: Jean-Michel Jarre beaming on stage, proving that geeks know how to party too. Tal, a photo by Elfworld on Flickr. 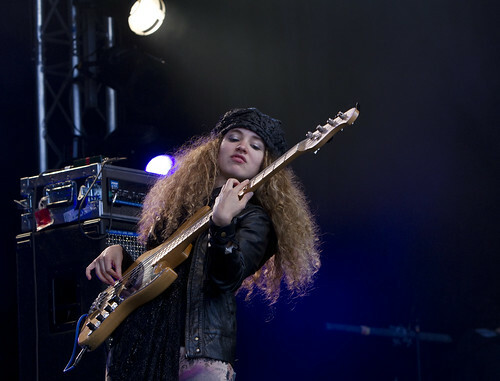 Tal Wilkenfeld was the highlight of the Herbie Hancock concert in 2011. In her early twenties, and she’s already high in demand as a touring and session musician. Leonard Cohen, a photo by Elfworld on Flickr. As I mentioned yesterday, I sold three photos to the local hotel Molde Fjordstuer, meant for one of their newly built rooms. Namely, their jazz suite. This is the second of the tree photos. 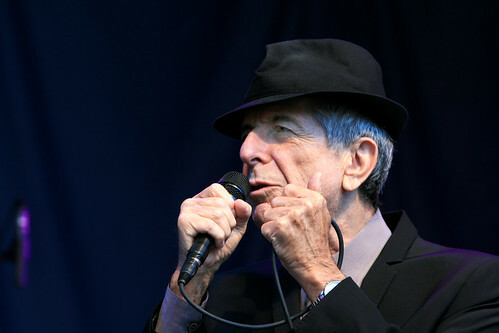 Leonard Cohen during Molde International Jazz Festival 2009. It’s one of the things I like about the jazz festival. You get to shoot old legends. Otomoyo Yoshohide, a photo by Elfworld on Flickr. I sold three photos to Molde Fjordstuer today! It’s a local hotel by the seaside, and they are building a new building and have added even more rooms to the hotel. 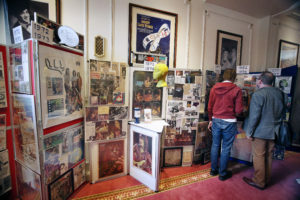 One of the rooms is a jazz suite, and they were looking for photos from Molde International Jazz Festival. A photographic colleague of mine was the middle ma..ehh woman, and lo and behold, I sold three photos! I’m very grateful to her! This is the first photo that was chosen. It’s probably the best photo I took during Molde International Jazz Festival 2009. My favourite concert that year, as well. This is Otomoyo Yoshohide, Japanese musician who had put together a project for the occasion. Probably the best photo I took during Molde International Jazz Festival 2009. My favourite concert that year, as well. This is Otomoyo Yoshohide, Japanese musician who had put together a project for the occasion.